What You Need:Â 1 sheet blue construction paper; brown and green poster paint; paintbrush; popped popcorn; glue. 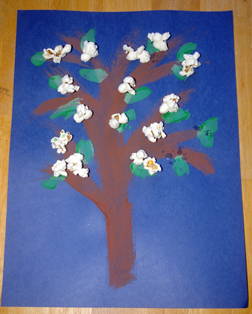 How to Make It: Children paint tree trunk and leaves and then glue on popcorn for blossoms! This entry was posted on Tuesday, January 20th, 2009 at 1:25 pm	and is filed under food crafts, spring crafts. You can follow any responses to this entry through the RSS 2.0 feed. Responses are currently closed, but you can trackback from your own site.